Kristi and I stumbled upon the realization that we’ve become minimalists. And it is exciting. Then, an unexpected blessing came about. Our neighbors don’t clean their apartment, or put much food away, so they had problems with bugs. We share a wall with them, so we got to share their problem with bugs. The landlord sprayed both of our apartments, and in preparing for that spraying, we had to pile almost all of our possessions in the middle of our living room. We realized, quickly, that we had a lot of stuff. So we got rid of stuff that we obviously did not need. Then,once we started putting things away, we got rid of more stuff. Then, we stumbled across books and blogs that talk about having even less stuff, in order to free up mental and physical space. Cleats that I’ve not used in two years. Climbing shoes that have holes in the toes. An old harness that has a well loved belay loop, that I really shouldn’t use anymore. Shirts that I don’t like, but don’t hate, so I wear ‘em only when I’m out of everything else. Shorts that don’t fit right. Pants that I’ve not worn in a year. A blazer I bought for $2 at a thrift store and wore once. Another pair of uncomfortable dress shoes. Belts that I don’t wear. My second pair of pajama pants. Cups we’ve not used in a year. A cup-cake baking sheet we’ve never used. Little nesting bowls we’ve never used. A spare set of plates someone gave us, but we never use. Tools that are made redundant by smaller and more compact tools. Little trinkets of crap I never use. Random pens we never use. 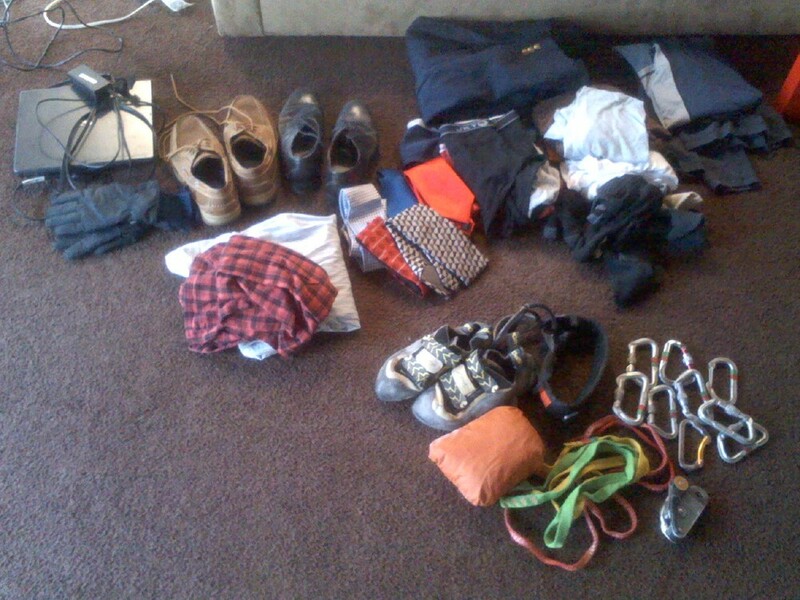 Climbing gear that is either old and heavy, or new(er) and dangerously worn. Books. So many books. My book collection had become an altar to the intelligence of Josh. If you visit our apartment, you’ll look through our books. (At least I hope you will.) You’ll think “man. He’s smart, if he reads this stuff.” When I look at my books, I think of what a towering intellect I am, because of my books. In reality, I’m probably not going to read most of ‘em. The idea of reading them is way more fun than actually reading them. I ditched the altar to myself, and cleared out two shelves worth of books. I ditched cook books, books about business, philosophy, economics. All of that. I’m a real person, I’m not going to read 600 pages about Immanuel Kant. Why kid myself? I got rid of all of them. We went from three crowded bookshelves to three sparse book shelves. We’re going to get rid of more. I don’t want to be burdened down by things. Every item you own takes up space, both in your home, and in your brain. If you move, so to do your things. They are anchors. I’ve slowly transitioned from thinking “I will keep this unless I can justify getting rid of it” to “I will get rid of this unless I can justify keeping it”. As I’ve de-cluttered, I have been able to check off a number of items from My Epic Quest of Awesome. I’m another few levels along. If you could get rid of three things, what would they be? What’s stopping you?